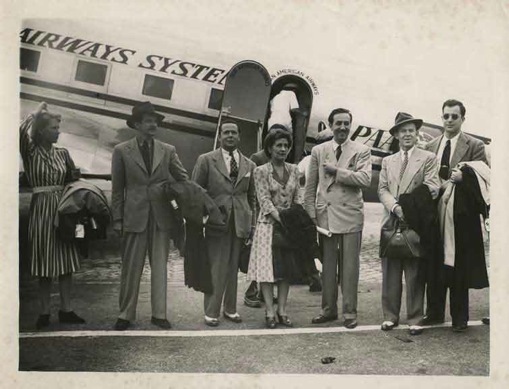 For ten weeks in 1941, Walt Disney, his wife Lilly, and sixteen colleagues from his studio visited nations in Latin America to gather story material for a series of films with South American themes. The feature documentary film WALT & EL GRUPO uses this framing device to explore inter-American relations, provide a rare glimpse into the artists who were part of the magic of Disney’s “golden age”, and give an unprecedented look at the 39 year-old Walt Disney during one of the most challenging times of his entire life. Just as the film tackles multiple and interconnected topics, this website will be changing and growing with time. Please plan to check in periodically to see what’s new! WALT & EL GRUPO is a presentation of the Walt Disney Family Foundation Films in association with Theodore Thomas Productions.